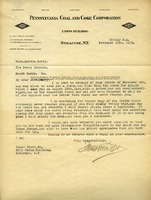 Mr. Stark writes to ask Miss Berry if she has received his letter and check written August 10th. He encloses the tissue copy of the letter because he wants her to see what his friends have to say about James Burney and promises to send a duplicate check if it was never received. 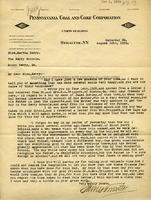 Mr. Stark writes to tell Miss Berry about the good her schools have done for James Burney, whom Mr. Stark's friends wrote to him about some months ago and has since been accepted to the Berry Schools. Mr. Stark wants Miss Berry to know how much her work has been appreciated by all involved in the situation.